Scared the living hell out of me, and I'm pretty hard to scare. Titan Books are launching the paperback this month and I've finally found time to give it a read. I have to say it lives up to all expectation, even that of "The Book that scared Stephen King". The plot examines the lives of the Barretts, a seemingly normal suburban American family who find themselves dealing with a situation that threatens to tear them apart when fourteen year old Majorie begins to show signs of acute schizophrenia. Doctors seem unable to help or prevent the severe and strange outbursts that happen to Majorie on an increasing basis. Reluctantly and with nothing left to try, they turn to Catholic Priest Father Wanderly for help. He suggests that the vulnerable teenager is beset by demons and that an exorcism should be performed. Short of funds they also find themselves host to a production company who turn their plight into reality TV. The story is narrated through the eyes of Merry, sister of Majorie; told as a series of flashbacks as she relates her experiences as an eight year old child to an author who intends on writing a book about what really happened. This introduces a wonderfully nuanced unreliable narrative edge - after all 15 years have passed since Merry witnessed the events and when she did she was an eight year old child. It's an interesting perspective that works well. A Head Full of Ghosts is a clever take on exorcism, as you might expect it references and offers comparison to that infamous film (and book) The Exorcist but also offers the occasional nod to a number of other stories such as Paranormal Activity and Possession (The cult 1981 Film, not to be confused with the book or 2002 film). There are loads of more obscure references too, some of which I didn't get until I read the notes at the end of the book. These references are subtle enough to avoid the book becoming self-indulgent or pastiched. The author avoids that trap many modern horror films and novels fall into, the irritating way they explain away the source of the horror. It keeps you guessing and avoids any exposition on what this particular horror really is. The book manages to provide a great deal of ambiguity over whether we are really dealling with possession or physcological issues and even right at the end it's still down to interpretation - and it's a wonderfully powerful ending. Tremblay also offers an insightful critique on "Reality TV", highlighting the intrusive nature, that an observer affects the actions of the observed along with the fact that such shows bear little resemblence to actual reality. Then we've got the slow implosion of the Barrett family, each character of which is fully fleshed out into a three dimensional person, adding depth to the conflict and offering a wonderfully rich dialogue on the struggles such a fracture of the family unit could cause. It's this family crisis that lies at the real heart of the book. The author wraps all this up into rich, rewarding prose with a genuine sense of horror and a masterplay on how to build suspense. 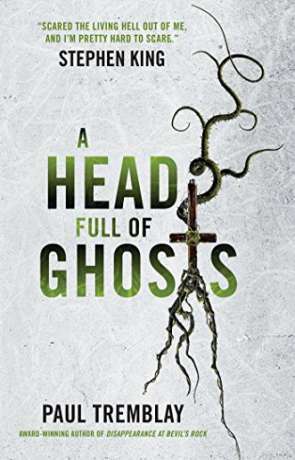 A Head Full of Ghosts is astonishing, it's subtle style belies the power it emparts, an effortless prose immerses you and magnifies the suspense, the horror. When it comes the ending takes your breath away. Memorable, magical, magnificent. Written on 19th September 2016 by Ant.